We are rapidly approaching the stage of the season where matches between sides at the top of their respective leagues take on extra significance. This match in Serie A was no different as top of the table Napoli welcomed champions Juventus to Naples. The spectacle was only increased with the match being moved to Friday evening to allow both sides to prepare for their upcoming Champions League ties. Under Maurizio Sarri Napoli enjoy a growing reputation for playing attractive football and there is a sense around the city that this could be the season where the Scudetto comes back to the city, for the first time since the days of Diego Maradona. Juventus on the other hand are in the middle of a season of transition, coach Max Allegri has struggled to find balance among his playing staff and it appears as though they face an uphill challenge if they are to retain their place as league champions. The home side lined up as expected in their 4-3-3 system with the Spaniard Pepe Reina in goal behind a back four of Elseid Hysaj, Raul Albiol, Kalidou Koulibaly and Mario Rui. They play with three in midfield as Jorginho plays in the more central role with the responsibility to continuously move and recycle possession. To the right of Jorginho the Brazilian Allan was preferred with his more physical style of play complimenting the more cerebral Jorginho. To the left club captain Marek Hamsik has a more attacking role. In the attack the Belgian Dries Mertens is flanked by Lorenzo Insigne and Jose Callejon. Juventus on the other hand have changed system several times this season but started in something approaching a 4-4-1-1 system. Gianluca Buffon was back in goal for Juve with a back four of Mattia Di Sciglio, Mehedi Benatia, Giorgio Chiellini and Kwando Asamoah. In midfield Miraljem Pjanic and Sami Khedira started centrally with Blaise Matuidi playing more towards the left and Douglas Costa on the right. Gonzalo Higuain played as the lone striker with Paulo Dybala taking up a slightly withdrawn role. In the face of the attacking threat posed by Napoli we saw Juventus defend in a strong and compact shape in order to negate the passing lanes that are open to the home side. While they were relatively happy to allow Napoli to pass the ball across the width of the field in safe areas of the field. With Blaise Matuidi playing on the left of the midfield in a slightly more narrow position Juventus were able to close down the attacking threat posed on that side of the field by Jose Callejon but it was the ability of the defensive block to shift across the width of the field as required that was most impressive. Here as Napoli try to advance the ball down the right hand side you can see that the two near sided attacking players are comfortably covered by the Juventus defensive line. The gap between the defensive line and the midfield line is also compact enough to deny Napoli any space in the central areas in to which they can move and attack. This positioning from the Juventus defensive unit saw Napoli enjoy a high amount of possession but instead of being able to penetrate the oppositions defensive structure as they normally would they were having to work the ball from side to side in front of the defensive block. Here once again we see Napoli trying to penetrate the Juventus defence down in the wide area although this time they are attacking down the left hand side. The four midfielders for Juventus have shifted over to the strong side of the field (closest to the ball) and are positioned in such a way to negate the passing lanes that are open to Napoli. With three Napoli players out in the wide areas they are increasingly dependent on attempting to overload the wide areas in order to find a way through. With the numerical superiority enjoyed in the centre of the field by Juventus they are happy to allow Napoli to build and attack down the wide areas safe in the knowledge that they should be able to deal with any balls that are crossed in to the penalty area. By remaining compact in the defensive phase and denying Napoli the chance to play through the central areas Juventus were able to frustrate the home side for large periods of the match. With the aforementioned left orientated position taken up by the French international Blaise Matuidi essentially leaving Jose Callejon isolated we saw a much more pronounced move from Napoli to attack down the left hand side of the field. This passmap was created by the excellent @11tegen11 using opta data we can see a clear preference for attacking down the left hand side. 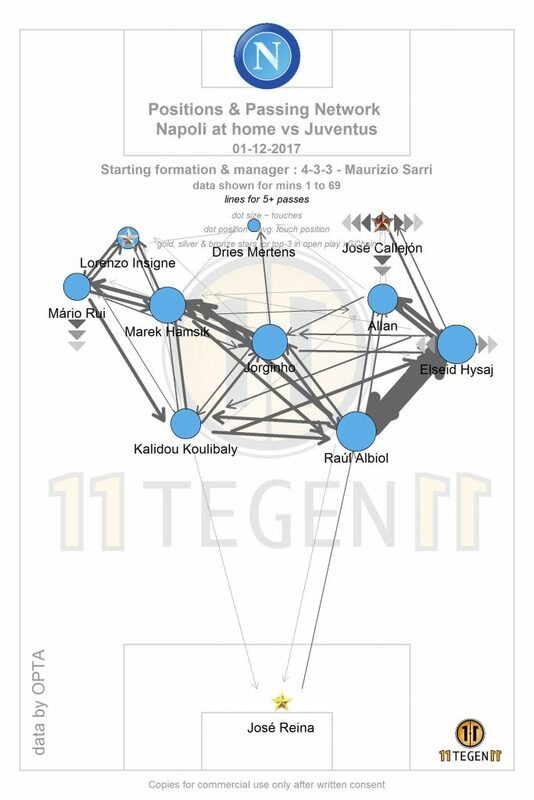 On the right hand side the link to Callejon is fractured while the link between Hysaj and Allan and Hysaj and Albiol is extremely strong. This suggests that when attacking down the right side Napoli were constantly checking play under pressure and playing back through the central defenders to recycle the ball. Here we see Marek Hamsik in a central position having moved centrally from the left half space in order to take possession and try to influence play more effectively. When he collects the ball the preference for Napoli under Sarri is to play forwards and try to break the defensive lines of the opposition. in this instance though there are no passing lanes open to allow the ball to be played through the centre. As you can see Juventus are compact and looking to force Napoli to play the ball out wide. In the end Hamsik is forced to do just that with a pass out in to the wide space for the left back Mario Rui to move forward and collect possession. The position in which Rui takes the ball however allows Juventus to move their block across to squeeze the man and cause a turnover. Here again we see Napoli in possession but this time in a quicker transition. As Hamsik makes a run ahead of the ball through the centre of the field he attracts the attention of three Juventus players. This allows the ball to be switched over in to the left hand space once again as left back Mario Rui looks to move in to an advanced position to support the attack. Another aspect of the football played by Napoli under Sarri has been the high press with the front three in particular working extremely hard to prevent the opposition from building out from the back with easy possession. In this match however Juventus were impressive in the way that they resisted the press from the home team and played out from the back. More impressive was the manner in which they bypassed the press using the centre or the wide areas of the field equally. Here we see Miraljem Pjanic having dropped extremely deep to collect the ball from the goalkeeper in front of the initial press from Napoli. 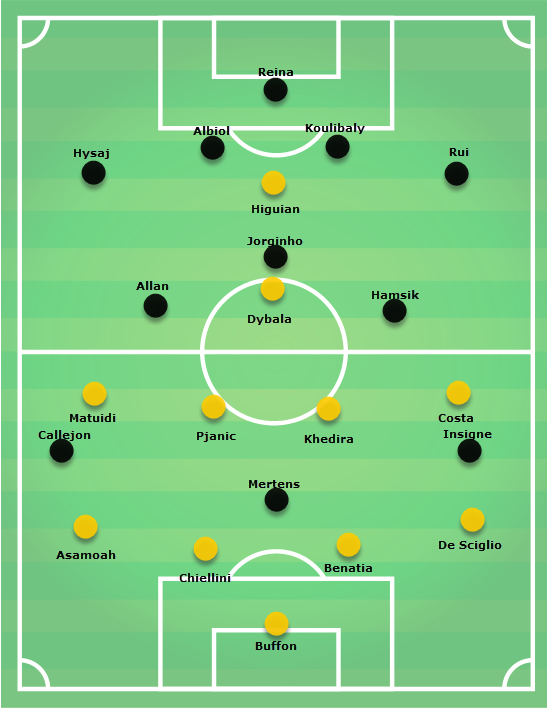 The run from Sami Khedira out towards the right hand side for Juventus opens up the passing lane to Paulo Dybala and in Pjanic Juventus have a player with the technical quality to make the relatively difficult driven pass through to the forward who is then able to turn and move off into space. This time we see Juventus recycle the ball across the width of the field from Di Sciglio on the right all the way out to Asamoah in the left back slot. By quickly moving the ball across the field in this manner they are forcing the pressing line from Napoli to quickly adjust their positioning and to move across the width of the field. This in turn made it difficult for the home side to press effectively. In the end this was pretty much the perfect game from Max Allegri and Juventus. The game was tight throughout with Juventus compact and unyielding to the attack from the home side. Clear cut chances were kept to a minimum throughout the match and gradually Napoli ran out of momentum as they tried to breakthrough. As you can see from the expected goals plot, once again created by @11tegen11 there was very little in this match in terms of chances created with Juventus just edging the match. There is little doubt that this result has increased the pressure on Napoli as they look to retain their position at the head of Serie A with both Juventus and Inter Milan maintaining a close challenge. It will be important for Sarri to refocus his side for the next round of domestic fixtures in an attempt to get over this defeat as quickly as possible.